Description: Like many Pacific Salmon, Chinook will change in appearance and colour as they travel from saltwater to the freshwater rivers. On entering freshwater for the first time Chinook have a very silver colour with deep black markings. The longer these fish are in freshwater the more they change. Firstly, they lose the silver sheen and they begin to look like an Atlantic Salmon with their colour changing to an autumn effect. This change continues and the fish start to turn darker and greener in colour above the lateral line and more red below the lateral line. One distinguishing feature of the Chinook and one to help identify the species is its dark gum line that gives the fish the appearance of having a black mouth. This is present when the fish are both in freshwater and saltwater. One thing Chinooks are famous for is their fighting capabilities. They are also known as the hardest fighting Salmon. Where to catch: Chinook were originally found in rivers from North America, Canada, Alaska as well as Asian rivers from Northern Japan right through to the Arctic in east Siberia. Over the years and under the influence of man, some areas have seen a dramatic decline and others are prospering as populations have been introduced into more inaccessible areas. Some of the most famous Chinook rivers in the world are Kenai River Alaska, Nushagak River Alaska, Goodnews River Alaska, Togiak River Alaska, Kalum River BC and Skeena River BC. These fish can now also be found in as remote waters as Patagonian and some of these fisheries are producing fish of huge proportions that each year keep nudging the current world record. One such little-known river and one to keep your eye on as it probably holds the next world record is Caterina River in Argentina. Average Size: Chinook can be found as small as 10lb which are normally referred to as “Jacks” these are immature males that have followed the returning shoals of adult fish to spawn in their home rivers. At the other end of the scale, some of the adult fish can reach sizes touching over 100lb. The average size of fish caught by rod and reel is approx. 30lb, anything 30lb or more is considered a trophy fish. Fishing Methods: There are various methods of catching Chinook from fishing with bait consisting of small sacks full of fish spawn to trolling with lures. 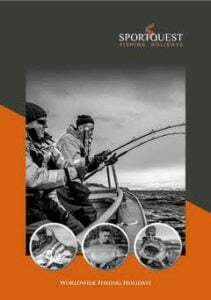 However, by far the most sporting and popular method for travelling anglers just looking for sports fishing and not to just fill up their freezers is fly fishing. You will hear lots of people talking about swing flies for Chinooks. In basic terms, it is fishing with double handed rods and Spey lines to cover as much water as possible, then as the current pulls the line around the flies swings across the river. The depth of the fly depends on many factors such as fly line and sink rate tips. However, one thing is for sure – when fly fishing for Chinooks you need to be close to the bottom. Chinooks do not like bright light and prefer the darker deeper waters. Quite often if you find a holding pool you will find all the other types of Salmon above the Chinooks and they can be quite challenging to get through. Flies tend to be large and bulky with vibrant colours. This is because you are not trying to imitate its food, you are trying to annoy the fish into striking your fly. If the fishing conditions are bright and the water is clear you have what we call soft Chinooks, as they never seem to bite. However, if you scale things down to just a small lightly dressed fly it is surprising just how effective this method can be. With clear water, bright conditions and large flies a Chinook can see the large fly from quite a distance. Because of this, by the time the fly gets to within the Chinooks striking distance, it may have seen this fly 10 times already. Chinooks are not likely to strike a fly they have seen over and over again. Now take the same conditions and fish with a very small fly. This time the Chinook cannot see the fly at great distances so only gets to see the fly for the first time when it is in its range.